Download the bot from the release tab. If you want the latest Beta-Build, you have to download the build from the Beta-Build branch and compile them by yourself with VisualStudio 2015. Finally, v2.0.0 Release has come! A complete change in the logic part. We now merge with Necrobot since they are more stable and have a better structure than our logic part. A completely new SettingForm, Tones of settings visualize on one single gui. And more! Please refer to the previous beta builds if you want more detail changes. -Logic improvements, fix flag issue -UI updates again! Special thanks to @Jimmy062006 & @Ricky & All the awesome developers in #dev-tea-house! There are problems with google oauth login, so we have to use account and password to login for now. To ensure your account’s safety, we suggest you to creat an app password just for botting. This will also allows users with 2-fact-auth enable to use the bot. Change your settings using the settings tab on the bot. If you want more advance settings, edit the settings file under the bot’s folder. Click Start Bot and enjoy! You can contribute in many ways, here are some that you can do to help the project out! Same as above, you can help by answering questions in the issues tab! Report bugs you found in issues. In order to help us fix the problem, please take a screenshot of the error you get and also attatch your log file (under the Logs folder) as well. Add [Bug] to the title to help us quickly identify the category of the issue. Tell us what you think we can do better in issues. You can contribute to the project by helping us on coding. Fork this project and creat a new branch to add your code or fix a know issue. username – for PTC account. No need for when using Google. password – for PTC account. No need for when using Google. [email protected] – for Google account. No need for when using PTC. password – for Google account. No need for when using PTC. 12.345678 – Latitude of your location you want to use the bot in. Number between -90 and +90. Doesn’t matter how many numbers stand after the comma. 123.456789 – Longitude of your location you want to use the bot in. Number between -180 and +180. Doesn’t matter how many numbers stand after the comma. time – Every X amount of time it prints the current level and experience needed for the next level. levelup – Only outputs the level and needed experience for next level on levelup. seconds – After X seconds it will print the current level and experience needed for levelup when using time mode. false – Recycler not active. seconds – After X seconds it recycles items from the filter in Settings.cs. 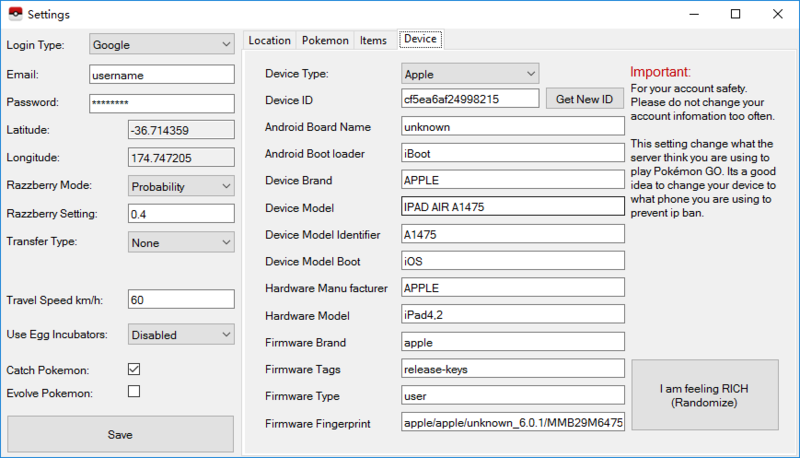 english – Outputs caught Pokémon in english name. german – Outputs caught Pokémon in german name. cp – Use RazzBerry when Pokémon is over specific CP. 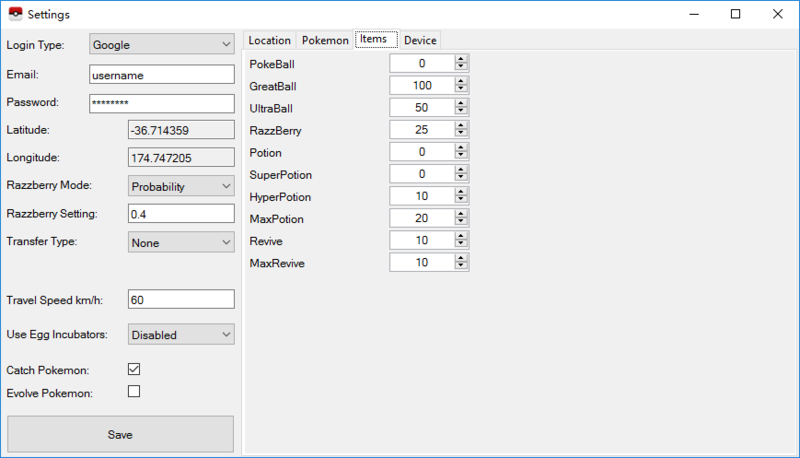 probability – Use RazzBerry when Pokémon catch chance is under a specific percentage. probability value – If RazzBerryMode is probability. Use Razzberry when % of catching is under this value. Between 0 and 1. CP – transfers all Pokémon with less CP than this value. IV – transfers all Pokémon with less IV than this value. Between 0 and 1.
false – Evolves no Pokémon. true – Evolves all Pokémon.